I really enjoy a good bread and butter pickle. Tangy and crisp, and if it’s spicy, even better! 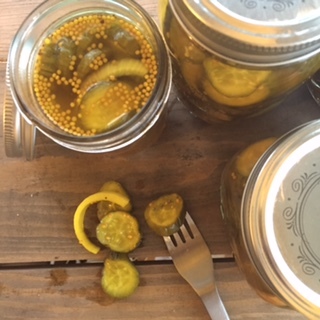 I’ve never made pickles before. 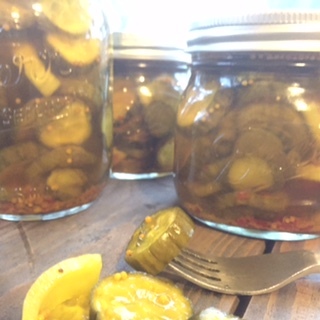 I always make the Aunt Bea “kerosene cucumber” joke in my head when I think about pickling. Listen, I’m a fan of The Andy Griffith Show, it’s time you all knew. When I say “fan”, I mean that I know all of the episodes and can probably quote at least a portion of each. I may make future references so, you should probably up your Mayberry game, just in case! I mean, what’s the worst thing that could happen? You get a little homespun moral fortitude? Hell, you might even solve a major life problem in thirty minutes or less! But I digress… Ain’t Bea made some pickles and they were all bad. That is not the case here! 3 heaping Tbsp crushed red chili flakes. This ingredient is optional. They will still be quite delicious, but they will not be “Pow Pow”! Toss cucumber chips and onions with salt and place in a colander over a bowl. Let stand for about two hours. They will release a lot of water in this time. rinse and place in a single layer on paper towel lined sheet pans. Place another layer of paper towels on top and let them dry over night. 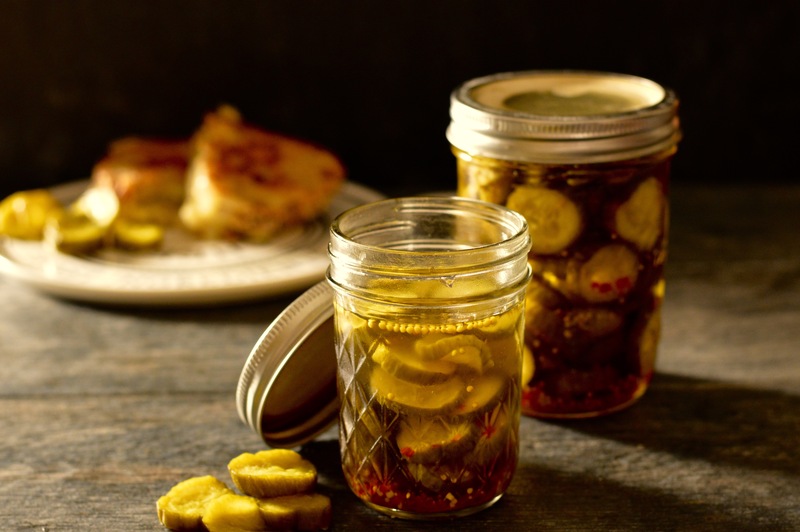 The next day, fill sterile canning jars with cucumbers and onion. Be sure to leave a half inch or so, to the top of the rim. Combine vinegar, water sugar and spices in a large sauce pan. Heat to boiling. 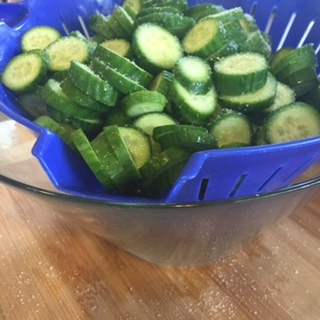 Pour vinegar mixture over cucumbers and onions and screw on lids. Seal properly by placing jars into a boiling water bath. Allow the flavors to develop for at least three days before opening. Serve chilled as a condiment or eat alone for a zippy snack!